The Cloud Forest mimics the conditions of a mountain environment. The higher you go on the “mountain,” the shorter the trees and shrubs get, just as if you were climbing a real peak. The structure showcases plants that can be found in the tropical highlands up to 6,500 feet above sea level, this way if you never get the chance to climb that high, you can still see what plant life is like up there. The faux-mountain is about 115 feet tall. From the top, the world’s largest indoor waterfall rains down to the ground, misting those who enter the greenhouse. The Cloud Forest has nine different “zones” representing nine unique areas where plants grow. Visitors are able to "climb" the man-made mountain using elevators in its center, and observe the vegetation growing on its sides (and navigate to new floors) using elevated walkways around its perimeter. A "Tree Top Walk" offers a birds-eye view of the top of trees growing at the mountain's base, and a "Cloud Walk" at the top provides a stroll through the fluffy figures usually stared at from below or a plane window. The Secret Garden is the final piece of the Cloud Forest, and is located in a secluded area that leads to the building’s exit. This garden features plants that once grew plentifully, but have now become quite rare, including prehistoric ferns and peperomias. The Supertree Grove at Gardens by the Bay contains 12 of the 18 trees on the property. The tallest measures in at 16 stories high. Each supertree has four parts: a concrete core, a steel trunk, planting panels, and a canopy. On each panel, a plant species has been planted, with varieties ranging from ferns to orchids. 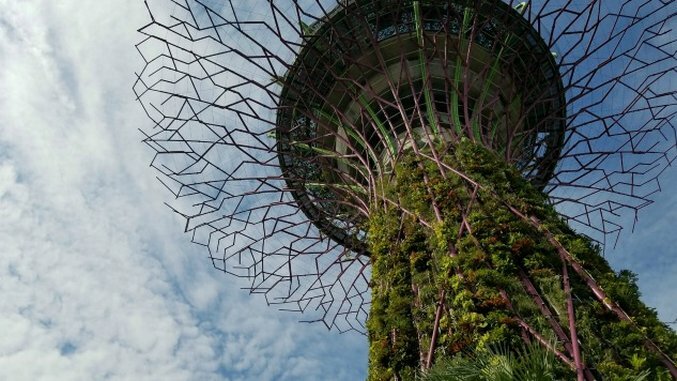 The plants can exist without soil and thrive in a vertical environment, which is why they were chosen for Gardens by the Bay. The trees will eventually become covered in vegetation. The Supertree Grove is open daily from 5 a.m. to 2 a.m., with a spectacular light and sound display available for visitors at night. Perched between Supertrees, the OCBC Skyway offers visitors a one-of-a-kind walk 72-feet in the sky. The aerial walkway provides horticulture fans with a close-up of the plants growing on the side of the supertrees, as well as breathtaking views of Singapore from a variety of different and unique angles. Gardens by the Bay’s Flower Dome is the largest glass greenhouse in the world. Inside you’ll find plants from Italy, Spain, South Africa, and even California. Wander the multi-level halls, and explore some of each area’s most beautiful plants and flowers, including everything from orchids to olive trees. Located just outside the Supertree Grove you’ll find the Floral Clock. The clock was inspired by the timepieces of Swiss watchmaker Audemars Piquet, and was given as a gift to the gardens by the watchmaker. Its hands are guided by GPS technology, and its design resembles Piquet’s Royal Oak Collection of watches. Dragonfly Lake features large metal dragonflies as well as a number of aquatic plants and fish. The lake is open until 2 a.m. each day, and on-site binoculars help visitors see everything around the lake. The body of water even features a 1,444-foot boardwalk. Despite its newness, the gardens are exceptionally popular, attracting more than 6.4 million visitors in 2014, and hosting its 20 millionth visitor in November of last year. On the grounds, you’ll find man-made to perfection nature-crazed attractions like the Flower Dome, the Cloud Forest and the Supertree Grove. All of the indoor greenhouses are air-conditioned (something you’ll certainly appreciate in Singapore’s tropical climate). When planning a trip, you may want to position your journey toward either the early morning or evening hours so you can explore the outdoor gardens and Supertree Grove without having to spend much time outdoors during the exceptionally hot and humid mid-day hours. Or, if you don’t have the opportunity to go at all, this virtual tour of our favorite spots in the 250-acre park should suffice for now. For more of the gardens, check out our 360-degree videos below, which will make you feel like you’re there. Emily Price is a freelance tech + travel journalist, craft beer aficionado at PasteMagazine, power napper. Likes: apps, startups, IPAs, and you.